Tampa, FL, March 9, 2017 – TeamViewer®, a global technology company with products that have been activated on more than 1.3 billion devices, today announces its listing on AWS Marketplace for Desktop Apps, which offers subscription based applications to Amazon WorkSpaces customers. Amazon WorkSpaces is a fully managed, secure desktop computing service which runs on the Amazon Web Services (AWS) Cloud. The integration of TeamViewer means Amazon WorkSpaces users can benefit from TeamViewer’s remote support and access capabilities. 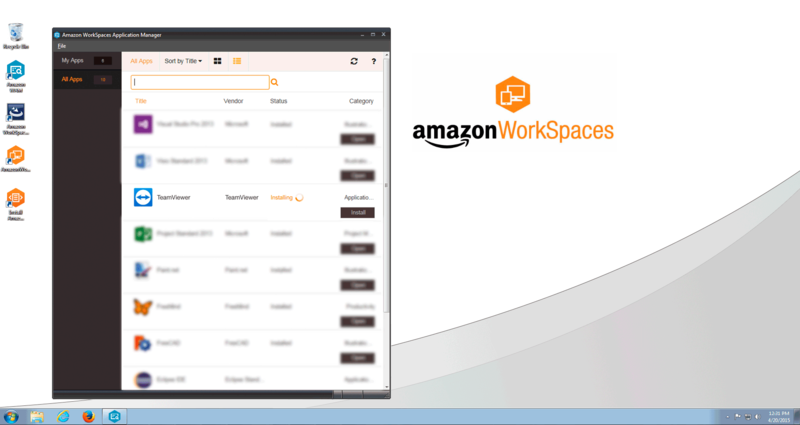 Amazon WorkSpaces provides a secure, managed, cloud-based virtual desktop experience. Unlike traditional on-premises Virtual Desktop Infrastructure (VDI) solutions, you don’t have to worry about procuring, deploying, and managing a complex environment – Amazon WorkSpaces takes care of the heavy lifting and provides a fully managed service. With Amazon WorkSpaces, you can deliver a high quality portable desktop, and applications, to your users on the device of their choice. AWS Marketplace for Desktop Apps enables Amazon WorkSpaces customers to select and deploy applications as quickly as they set up their Amazon WorkSpaces, and leverage a monthly subscription model. Remote support through TeamViewer will allow WorkSpaces customers to give and receive support easily at any time to ensure issues are resolved quickly. Using TeamViewer, customers can provide remote desktop access to a user who is working on a different device in a separate location. This not only allows for effortless provisioning of virtual resources, but also for easy maintenance of these resources.